Lower Gas Prices Are Not Good For Us. In the last 4 days, I have seen our local gas prices go up by $.10…and I could not be happier about it. Call me crazy, but I think gas should be more expensive, not less expensive. In Europe, gas costs somewhere around 4 times what we pay for it here! I know in this economy we reportedly need low gas prices to at least help keep things going for a while longer (before everything falls apart, that is), but at $1.59 a gallon, we are getting it for virtually nothing. I was talking with a friend the other day and we decided that at this price, it felt like gas was free compared to the $5.00/gallon I paid in Los Angeles right before we moved here. Right now, a gallon of regular non-organic milk is $2.50 and a gallon of orange juice is $5 – on sale! Yet somehow gasoline – which is brought up from the middle of the planet as crude oil, gets refined, stored, shipped, delivered, put into pumps and into our car – is only $1.59 a gallon. Something is amiss here with this equation. Yes, food should be expensive, as it is what keeps us alive. But what oil has to go through to get to our cars means it should be much more expensive…but it’s not. And I think that is a bad thing for both us and our planet. I do realize that when gas shot up to $5 a gallon in major cities that people stopped buying oversized school buses to commute alone to work in. I also realize that more people started taking public transportation, too. I get that, it’s a good thing, and it was about time. While the rest of the world has been downsizing their automobiles, riding Vespas, and investing in high-speed efficient rail travel, we were on a binge for what Doug Fine calls “ROAT’s” – Ridiculously Oversized American Trucks. (If you have not read Fine’s book Farewell, My Subaru, you are missing out big time – here is my review.) We could not get enough of these vehicles, and they kept getting bigger and bigger and bigger – until they became a joke unto themselves. I will never forget the time I was in France at an outdoor cafe and a Hummer drove by on those little skinny streets they have. The people at the table next to me (about 3 inches away – this is France we are talking about here) started pointing and laughing at the driver, making fun of the truck. I laughed along too, as I think they are dumb…but a lot of people don’t and found themselves with these behemoths sitting still in their driveway because they could not afford the gasoline to run them anymore. And while the gas prices were hurting my wallet as well, I could not help but be happy that the prices were going to make people think long-term about the cars and trucks they buy; but then gas prices started falling. Do I think that the majority of people will all of a sudden forget $5/gallon gas and run out to buy ROAT’s again? Nah, I doubt it. Will some? Of course. But I was hopeful that gas prices would stay reasonably high so that both consumers when making a purchase choice would buy a fuel efficient vehicle and our manufacturers would start building them. There is no question why the American manufacturers are suffering and asking for handouts – they cannot (and have chosen not to) compete with the Japanese and Germans on style, reliability and fuel efficiency. They continued to build and push big trucks and gas guzzlers on the American public, and many consumers went elsewhere because really, who can afford 18 MPG at $5 a gallon? And that is why I think lower gas prices are bad for us – I do not want to see us revert to behavior that will only hurt us down the line. We need to focus on hybrid and/or electric cars (my preference) right now, and higher gas prices will force us AND the manufacturers to make that happen. If gas stays cheap, a lot of people will not see the value in investing in these technologies, and it will only delay the inevitable – gas at exorbitant prices and cars that still only get 20 MPG. And that’s why lower gas prices are not good for us…at all. “but lets safeguard the people who really can’t afford to pay high gas prices.” – that is what I see as the problem though, as if we don’t make fuel more expensive, the research and development (and habit changes) will not be made fast enough, and then I think our situation will only get worse as time goes by. I hope that makes sense! Although high gas prices do have some effect on superfluous consumption, they ultimately represent a regressive policy. There are way too many people in the US who *must* drive long distances to work in low paying jobs, sometimes in jobs where ‘use your own car at your expense’ is the price of having a job, people who don’t live where mass transit is available. High gas prices are a real killer for them. 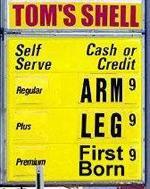 When I lived on the East Coast the price of gas hardly mattered. For people in the farflung rural West high gas prices can be the equivalent of a significant cut in pay at a time when they can’t afford it. So ‘no’ to gasguzzlers, and ‘yes’ to fuel efficient vehicles, but lets safeguard the people who really can’t afford to pay high gas prices. Haha ROATs – that’s hilarious! I think there may be such a thing as ROTTs, then. Sadly, Texas has it’s own phenomenon of larger than the rest of the country’s trucks. I mean, come on, Ford really needs a ‘Texas’ branded truck? Silly Texans. I’m with you. Keep going up gas prices – people only change when their wallets are impacted, although I hear what Dee is saying too. I wish that there was simple answer – there are people that are truly hurt by high gas prices, but that is a product of poor city planning (here’s where me being a Landscape Architect chimes in) and we’ve done it to ourselves. The fact that we planned our cities around the automobiles is going to be our ultimate downfall if mass transit is not addressed soon. There’s a reason why people in cities in the North East (and Europe) don’t need cars – their cities were not planned around the car – they were planned around communities and walking. Keep going south and west and the cities because less concerned with mass transit and more concerned with McMansions. Seriously, there is a “Texas” branded Ford? Yikes. Believe me, we don’t have public transportation here, but we have plenty of horses. I guess that will be my new “car” when gas gets too expensive! Yes, there slogan on the commercials is ‘Ford is the best in Texas.’ It’s so ingrained in my head I could sing you the jingle. We really need to get on about the business of becoming energy independent. This past year and the record gas prices played a huge part in our economic meltdown and seriously damaged our economy and society.We keep planning to spend BILLIONS on bailouts and stimulus plans.Bail us out of our dependence on foreign oil. Make electric plug in car technology more affordable. It cost the equivalent of 60 cents a gallon to drive an electric plug in car. The electric could be generated from wind or solar. If all gasoline cars, trucks, and SUV’s instead had plug-in electric drive trains, the amount of electricity needed to replace gasoline is about equal to the estimated wind energy potential of the state of North Dakota. Get with it! Utilize free sources such as wind and solar. Stop throwing away money on things that don’t work. Invest in America and it’s energy independence. Create cheap clean energy, create millions of badly needed green collar jobs. Put America back to work. It is a win-win situation. We have to become more proactive citizens, educate ourselves and demand our elected officials move this country forward into the era of energy independence. Jeff Wilson’s new book The Manhattan Project of 2009 Energy Independence NOW outlines a plan for America to wean itself off oil. We need a plan and we need it now! I couldn’t agree with you more. I didn’t think the high gas prices were a bad thing. But, I drive less than 25 miles a week on average. I just don’t think change will come fast enough if gas is cheap. I think I’d still feel this way if I had a long commute. It is cheap, considering how much work goes into growing it. Farmers get paid next to nothing and giant farms use all sorts of GMO’s and pesticides because we demand cheap food. What we are left with is corn syrup everything, which leads to diabetes, obesity and heart problems. It’s a very bad situation to be in, all in the name of cheap food. And that’s why it is worth it to me to pay more for healthy, organic, “fair trade” food that treats farmers, the earth, and myself better. I think food, which is required to keep us alive, should be cheap, not expensive.